I always wondered, why my 'pet weave' Harvest Moon is used or shown so seldom, while it's a real beauty. When preparing a teaching session, I found a possible cause - the CGI 'speedweaving' tutorial on MAIL is imho too complicated to be followed by a beginner. So I made my own. I used BA 16swg (~1.6mm) coiled on 19/64" (~7.5mm) mandrel, with a final AR of 5.0 for the sample photos. This is imho also among the most attractive ARs, while it can be woven down to around 4.65, and has no principal upper AR limit. Another fine ring size is 18swg 7/32" (1.2*5.5mm). 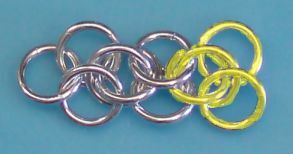 Step 1: Add a single ring to the starter's ring pair - now we have a 1-2-1 chain. Step 2: Weave a further single ring, this time 'backwards', sandwiched between the starter's ring pair, and 'left' around the previously set ring. 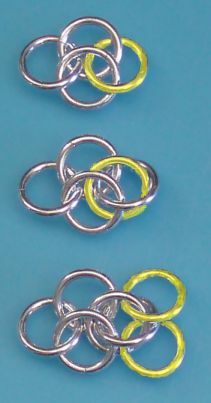 Step 3: Add a ring pair now, around step 2's ring, and sandwiching step 1's one. Now the chain's 'tail' looks like the starter's end, just rotated 90 degrees. Repeat steps 1 to 3. Now the chain's end has reached the orientation of the starter, again. 'Rinse and repeat', until the wished chain length is reached.